Generation Z: Will Tomorrow’s Money Makers Get Along With Traditional Financial Institutions? Millennials may be America’s largest active generation, but marketers are already thinking ahead. Meet Generation Z – the young folks born after 1990s who are now in their late teens and early twenties. Generation Z presents more challenges to the banking industry than any other generation in history. They are the cohort who have literally been born into the bourgeois family of technical innovation. They expect everything to be handed to them, on the spot, and in a convenient fashion. They are the Snapchat & Instagram generation. They are the cohort that is abandoning Facebook and Twitter. They have an attention span of only 8 seconds. They find email communications obsolete and prefer chats over any other form of communication. They are the “Pluralist society” - more likely to interact, have friends and acquaintances from various ethnic, racial and religious backgrounds than any other generation in history. From a behavioral point of view, Gen Z’ers are more financially conservative, they spend less, they borrow less and they worry more about their finances. They trust banks and investment companies less. They are less brand loyal. And the question is: If you're a bank, now what? Do you wait it out, or do you take a proactive approach to get ahead of the game? The consumer dominance of Gen Z’ers is not an IF. It's a WHEN. This is what you need to know about how it will affect you and what tactics you can take to pre-empt this massive change heading your way. A study conducted by Millennial Branding and Internships.com shows that Generation Z may very well be the most entrepreneurial cohort in history. 72% of high school students want to start a business someday, and 61% of them would prefer to work for themselves versus an employer. In contrast, Millennials will go down in history as the least entrepreneurial generation in history. As one survey showed, only 62% of millennials ever “considered starting their own business,” while only 2% of Millennials are currently self-employed. In contrast, Generation X had 7.6% self-employed people, while baby boomers had the highest rate of 8.3% self-employment. What does this mean for my banking institution? Financial institutions should begin to explore the types of financing and banking products they can offer to this entrepreneurial generation. New ways of assessing risk while extending lines of credit and flexible spending lines of credit will be key to penetrating the new Gen Z market. Gen Z is not only more connected than Millennials through digital products, they also prefer technology and innovation over everything else. A study on Gen Z use of technology shows that virtually every Gen Z member spends time online every single day of their lives (some while at church!). The majority of banks and financial institutions are now serving their user base through digital channels. However, the new generation’s habits will see the “digital first” companies get ahead of the pack at a much more accelerated pace than at any time in history. Gen Z is the zooming, pinching and swiping generation. They are also the generation most inclined to communicate with financial companies by chat, with almost half of them choosing chat over phone calls. And most importantly, 92% of them are satisfied with the resolution they receive when interacting with a business by chat, compared to 44% for phone. Technology is causing a shift in how Gen Z and brands interact with each other. It’s no longer just about providing a digital alternative to physical branches. Gen Z’s expect to do virtually everything on their smartphones. Realigning internal banking processes, investing in scalable digital infrastructures, and adopting a mobile-first culture is of paramount importance to any financial company that wants to stay relevant in tomorrow’s marketplace. Gen Z’ers are very concerned with their financial lives. A survey conducted by Ameritrade shows what the Gen Z youngsters are concerned about. These stats show the Gen Z desire to be independent both personally and financially, a theme consistent across studies of this demographic. One big area of concern where they are less financially responsible is their retirement plans. The average Gen Z’er plans to start saving for retirement at age 28. Retirement savings is Gen Z’s sixth priority in their adult life, falling behind getting a job, buying a car, paying off student debt, getting married, buying a home, and only slightly ahead of having children. For financial institutions operating in the retirement savings space, this should be a real source of concern. Developing engaging, useful and meaningful marketing strategies designed to help Gen Z’ers save early for a retirement goal should become the number one priority for companies operating in this space. In addition, creating simple-to-use user experiences while leveraging chatbot technologies, texting, and chat services is the only way financial services will be able to keep the Gen Z generation informed and engaged with regard to long-term savings goals and services. Having seen their parents live paycheck to paycheck, always worrying about making ends meet, and losing most of their savings during the financial crash of 2007-2008, the Gen Z cohort is substantially more concerned about how they spend their money. They don’t want to overextend, take on less debt than Millennials, and want more for their money. It’s not only that they have fewer credit cards – it’s that they have less debt overall. A recent study shows that Gen Z youngsters have half the post-college credit card debt of millennials. Another study has shown the average postgrad Gen Z member has only $14,446 in debt versus Baby Boomers’ $42,628 debt. Overall, it seems that adult Gen Z’ers are more likely to live within their means. But not all is rosy with the new generation. Multiple studies have shown that whereas the new generation is more fiscally responsible, they tend to de-prioritize long-term investments over the other generations. Only 17% of them believe stocks are a good long-term investment (this is the generation that witnessed their parents lose their life savings in the economic crash of 2007-2008). Overall, 57% of Gen Z’ers say they like to save money versus spending it. And whereas the majority of Gen Z’ers say saving money is important, they prefer simple saving accounts over any type of investment. There are two big exceptions: home ownership and car ownership. An astonishing 97% of Gen Z’ers want to own a house one day, in contrast to the national homeownership average of 65%. Similarly, 92% of Gen Z’ers plan to own a car. Gen Z’ers have seen their families lose their hard-earned money in the financial crash of 2007-2008. They have developed a natural distrust – and fear – towards traditional forms of investment. Many of them see real estate (homeownership) as a primary goal over any sort of long-term investments – including, stocks, bonds, mutual funds, and even 401k investments. That puts banks on the defensive. The new generation needs to be convinced that they should use at least some traditional banking products to their advantage. 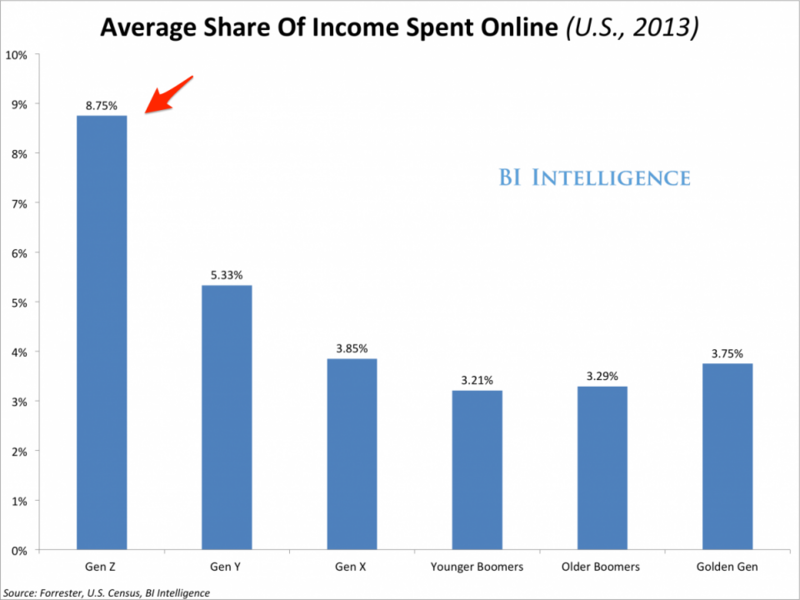 A different report from BI Intelligence shows that Gen Z spends the highest share of its income online, across all demographics. Not only are Gen Z’ers leading in digital customer spend, they are also leading the pack in terms of mobile payments taken at an in-store point of sale. A study published last year showed that Gen Z’ers have the highest percentage of mobile payments across all generations! Banks needs to understand that the life of a Gen Z’er is primarily driven by their smartphone. As we wrote elsewhere, they are the mobile generation. The challenge that banking and financial institutions will face is a cultural shift which will require a redefinition of how banks and people interact with each other. It’s not enough to say you will be adopting a digital-first strategy. You now need to take your strategy to a new level and ask yourself: how can a user achieve all their banking needs faster and in a more convenient fashion on the smartphone than over the phone, in person or on a website? You must meet Gen Z in the middle – and the middle is now the smartphone. When it comes to banking institutions, Gen Z’ers prefer an omnichannel experience. 38% of them use mobile apps for their banking activities, compared to 19% among other generations. They also use banking apps more – to the tune of 48 times a year, on average, versus 39 times among the other generations. At the same time a recent survey of 80,000 consumers shows that Gen Z’ers visit financial branches more than any other generation –76% of them have been to a bank branch over the last 12 months. The same report highlights the importance of customer satisfaction among Gen Z’ers. In particular, highly satisfied Gen Z customers are five times more likely to recommend their bank to their friends than other generations. A different report also highlights the fact that 39% of Gen Z respondents rank mobile banking a a top day-to-day banking feature. This shows the high expectations Gen Z’ers have toward their banking providers. Generation Z also prefers fee-free services, obsess over incredibly simple and intuitive user experiences, and love instant gratification when it comes to getting answers to their questions (source). Banks need to figure out intuitive and simple ways to quickly convey to the Gen Z’er the key information required to manage their financial lives. They are the most visual generation yet – overly connected through digital channels yet constantly switching from one task to another. Banks need to figure out how to present complex financial problems, key data points about a person’s financial life, and self-help options to Gen Z’ers in a very simple way. The battle over Gen Z’s business over the next decade is going to be carried out within the field of user experience. Only the companies that can give Gen Z’ers what they need in eight seconds or less will earn their hearts, minds, and business. Generation Z presents more challenges to the banking industry than any other generation in history. They have higher expectations from technological innovations and digital services than any other demographic. Their attention span when on digital products is only 8 seconds. They download at least one new application per week. They are digitally overconnected. They love snackable content. They expect to access information quickly and efficiently. These characteristics are both a curse and a blessing. They are a curse for companies used to doing “business as usual.” They will be most impacted when Gen Z reaches full maturity in terms of financial purchase power. They are a blessing because the differentiators that will make some financial companies successful at attracting Gen Z’s business are relatively easy to implement – and some banks and financial institutions have already started doing it. American Express, JP Morgan Chase and Capital One, among other big players, have already completely overhauled their mobile banking products. Whereas we see a trend in the right direction in the banking space, much ground has yet to be covered. The role of a bank in the next decade is both transactional – allow Gen Zers to get what they want when they want it – and educational. On the educational front, banks are now forced to not simply offer compelling products to Gen Z’ers; they must also defend the need and safety of these products to begin with. That means banks are no longer just a means of allowing customers to manage their money effectively. Banks need to compete in the content and user experience fields. They need to show their expertise with simple-to-use digital interfaces and they need to become their own media houses communicating effectively with their user base. Gen Z has been dubbed the Pluralist generation. Banks need to adopt the same pluralistic strategy if they want to stay relevant to the needs and expectations of tomorrow’s dominant demographic group.